Our distance learning courses run for ten months each. The very latest techniques, information, skills to ensure you get the success you crave for. All have Accreditation Certificates when the course is finished. They can be downloaded for convenience. Complete access to our founder, Dec Cluskey, is included by private telephone, Email, Fax, letter and SKYPE [the FREE Internet phone and video system].. The ten month award winning program of 2 easy to read manuals per month written by Dec Cluskey that started it all. Responsible for catapulting so many of the Members of 'The Serious Writers Guild'to massive success. Accreditation Certificate at end of course. Tax deductible. Would you like Dec to show you the road to success? Today ‘B’ has a £½Million contract with Sony plus a Publishing Contract for another 6 figure sum"
"tipped to become the next big British R&B Star next year"
What is the 'How To Make A $Million From your Music' program? A 'Teaching Materials' book and a 'Hard Music Facts' book in A4 format delivered to your door each month for ten months crammed full of knowledge, tricks and techniques that are unavailable anywhere else. The real chance to make a lifetime dream come true. You will get the real story of how to gain success, fame and fortune in the most lucrative Industry in the world...the Music Industry. Full Accreditation Certificate when you finish the course - making you an Associate Member of The Serious Writers Guild. What else will I get?? 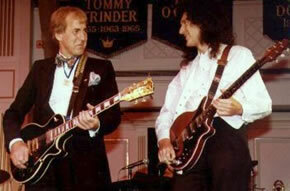 24/7 access to Dec himself....he Gigs with the Mighty...here he is on that famous Gig playing beside Brian May from ‘Queen’. What could you learn from him? He will talk to you personally by phone 10am to 9pm GMT, Monday to Friday. And fax, Email, Letter - seven days a week, 24 hours a day. Dec will help with any question...if he doesn't know the answer he will get it in 24 hours, guaranteed. Heard Enough? Want to get going now? Click here for fast application. - order within seven days and receive "So You’re Thinking of Mastering" [worth $24.67] absolutely FREE as a 'thank-you' from Dec.
as little as £19.57 or $27.97 monthly download Discounted when paid in full. Click here for fast application. One Top Ten Single can earn £150,000... $286,000. Easily $Millionaire status + incredible fame. Please do not apply if you are not serious. This is not a 'Get Rich Quick Scheme'. Music demands 100% commitment and 100% effort, nothing less. It is hard and dedicated work. All is possible with the right help?